Ants are the most numerous type of animal on Earth; their combined weight is greater than the combined weight of human kind . As of 2006, there are 11,800 known species of ant. They are a very successful insect species that hold interest because of their large colonies (‘social groups’) that consist of millions of individuals. Sometimes these groups will work together forming a massive super-colony. They are very efficient insects and are often represented as the ideal workers in fables and mythology . The ant is also referenced twice in Proverbs (in Proverbs 6:6-8 and Proverbs 30:24-28 ), where Solomon and Agur use them to instruct on industriousness and wisdom. Diagram illustrating the anatomy of a worker ant (Pachycondyla verenae). The body of the ant is divided into four major sections; the head, the alitrunk, the petiole, and the gaster. 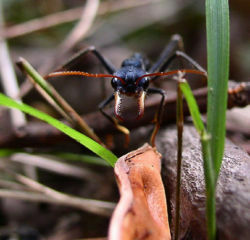 They have three pairs of legs, a single pair of antennae, strong mandibles, and fly-like compound eyes. Ants tend to come in dark or earthy tones. Different species come in varying shades of black, earth-tone reds, pale tans, and basic browns. Most males and breeding females have wings, though some have been born without flying appendages. Some species of ant are equipped with stingers for nest defense and subduing prey. The ants involved with reproduction are the queen, the winged breeding females, and winged males (drones). The winged breeding ants don’t do much except eat until the time of mating rolls around. The breeders then travel outside and take wing (mating occurs while in flight). The drones die shortly afterward while the surviving females seek a suitable spot to start a new colony. When they find one, the breeding females shed their wing and begin laying eggs. Photograph of ants herding aphids. Ants are great helpers to their given environment. In their ecosystems they turn over and oxygenate the soil as much as (or more than) earthworms do. In the tropics, the ants outrank grazing animals as the most important herbivores. Ants that thrive in the desert regions are among the principal seed consumers in their environment. They also herd and milk aphids. However, some species of ant are considered pests, because they love consuming the resources we require for comfortable living. For example, the carpenter ants love nothing more than munching away at the timbers that make up our homes, while other species go after our kitchens, pantries, and picnic baskets. There are a great many beneficial uses that humankind has found for ants. In some cultures, ants are a great delicacy; in others; merely an appetizer. They are also a good source of nutrition and can be eaten to help stave off starvation in the event you are lost in the wilderness (One of the survival tips given to tourists exploring the Grand Canyon). In some parts of the world ants have also been used as sutures. The sides of the wound are pressed together and ants are applied along the edge. The ants then defensively bite the edge of the wound; effectively sealing it up. 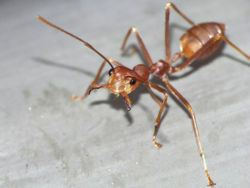 The ants’ bodies are then cut off, allowing the mandibles of the ants to hold the wound together for up to three days. Scanning electron microscope picture of ant head. Photograph of ant at Karnak Temple. Photograph of ant on human skin. This page was last modified on 19 September 2014, at 19:32.